The final thesis collection for this project can be viewed here. “All is flux. Nothing stays still,” is a fragment from the writings of ancient Greek philosopher, Heraclitus. Immediately this statement conjures notions of movement and flow, but also brings into question identity. How does one thing maintain identity through change while another thing does not? Because Heraclitus’ writings only exist as fragments, they are vague suggestions of ideas, rather than flushed out philosophical arguments. This provides an excellent base for design. It allows fabric to explore some of the inherent contradictions and haziness of his ideas. Much of what Heraclitus writes about change uses river imagery. “On those stepping into the same rivers. It is other and still others waters that flow.” This quote is replete with the ideas of identity, change, and movement. Taken at face value, it seems to reinforce the idea that “nothing stays still,” but another interpretation could be that the identity of a river is reliant on the constant movement of water— i.e., the fact that the waters are always moving is what makes a river a river as opposed to a pond or a lake. Many of the fabrics I developed have strong linear elements / components. Organic and irregular, they resemble the movement of water or could even be interpreted as a representation of time— the constant linear force and cause of change. The idea of repetition (an important element in knitting) is a prominent theme in Heraclitus’ writings— the idea is that each repetition is different or has changed in some way, yet still remains the same in others. This is evidenced in some of the visual references I pulled for this project— natural patterns typically have some kind of repeating element, but each repeat has changed enough for the pattern to appear organic. Many of these fabrics are about working with no pattern but a specific technique or sequence of techniques. This meant that each moment provided an opportunity for an intuitive decision and change to the overall design. 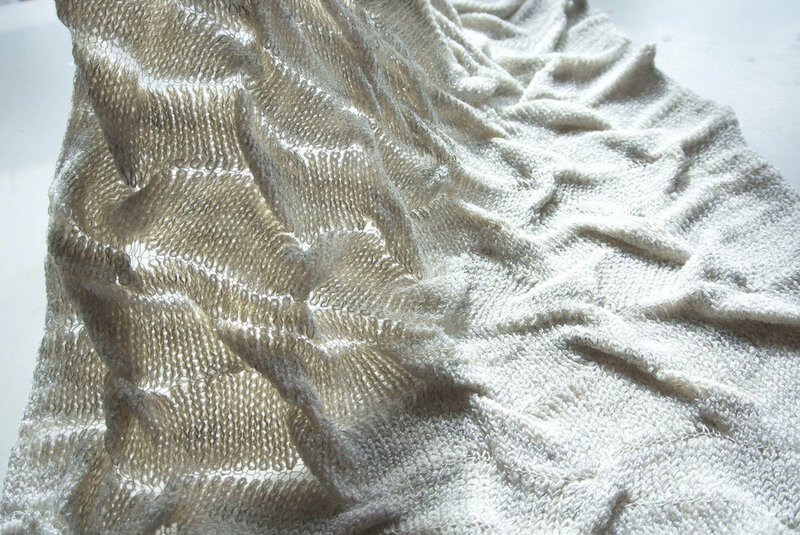 In other cases, like with knit-weave structures, I worked with a set pattern, but the much thicker weaving yarn distorts the pattern simply in virtue of the irregular way it forms floats.